If your doctor has recommended a chemotherapy port for chemotherapy, what exactly does this mean? What are the pros and cons of a port when compared with other methods of access such as an intravenous (IV) line or a PICC line? Let's take a look at exactly what having a port entails the advantages (the pros) and the disadvantages (the cons) of having a port or port-o-cath, and ways you may be able to prevent complications such as infection or obstruction of the port. What Is a Port for Chemotherapy? A chemotherapy port (also known as a "port-a-cath") is a small device that is implanted under your skin to allow easy access to your bloodstream. When Is a Port Used? A port can be used to draw blood and infuse chemotherapy drugs. It can also be used if you need transfusions of red blood cells or platelets. Without a port, or a PICC line, a new intravenous needle (IV) will need to be placed each time you have chemotherapy, and separate IV lines will need to be placed if your require IV fluids or a blood transfusion. Whether or not your doctor recommends a port may depend on several things. Some chemotherapy medications can only be given through a port, as they are too caustic to be delivered into a peripheral vein. If you will be having several infusions of chemotherapy (some oncologists recommend a port if you will more than four treatments), a port is often easier than inserting an IV each time. And some people have veins that are very difficult to access, making a port a better option than placing an IV. In order to make the best decision for you personally, let your doctor know if technicians have found it easy or difficult to draw blood or place an IV in your hand or arm in the past. (You may have heard a tech remark that you are an "easy stick" or a "hard stick"). A port is most often inserted during a same-day surgical procedure that can be performed with a local anesthetic. Most physicians prefer that you have your port placed at least one week before beginning chemotherapy (if possible) and studies suggest that having your port placed at least eight days prior to an infusion reduces the risk for complications. If you are having a surgical procedure for your cancer, such as a lobectomy for lung cancer or a mastectomy for breast cancer, your surgeon may insert a port at the same time your other surgery is performed. 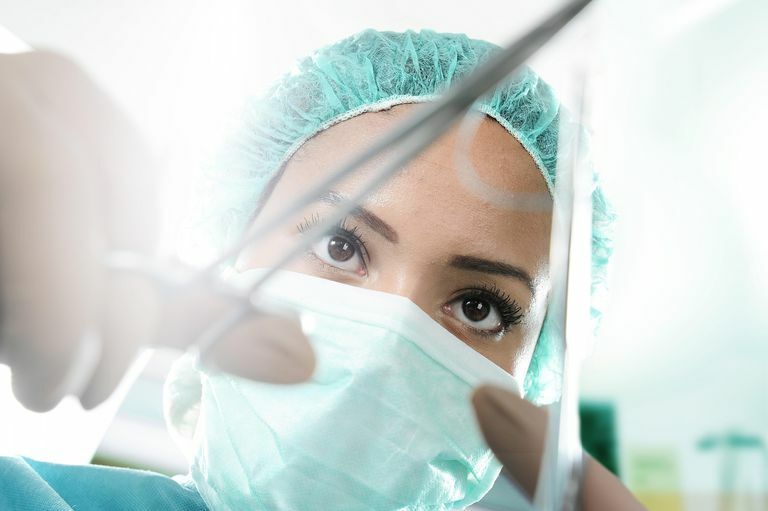 When a port is placed during surgery, you will already have a general anesthetic in place. During insertion, a small round metal or plastic disc is placed under your skin through an inch-or-two-long incision. This may be located on your upper chest or occasionally your upper arm. This port is then attached to a catheter tube that is threaded into one of the large veins near your neck, such as the subclavian vein or jugular vein, and ends near the top of your heart. After your port is placed your doctor will perform an x-ray to make sure the end of your port is in the proper location. After your port is placed, you will notice a slight protrusion of your skin, over the port. During blood draws or chemotherapy infusions, a nurse will insert a needle into your port in an area called the "septum," a resealing rubber center on your port. Since the port is completely under your skin, you will be able to bathe and swim without being concerned about getting an infection in your port. Avoiding delays: Not only do you avoid the delay of having your nurse attempt to find a good vein to draw blood or infuse chemotherapy, but having a port can reduce the time needed to prepare your hand or arm for the procedure. Lowering the risk of "extravasation:" When an IV is used, medications are more likely to leak (extravasate) into the tissues surrounding your hand or arm. Since many chemotherapy medications are caustic to tissue, a port can reduce the risk of inflammation-related to leakage of these medications. Easier bathing and swimming: Since a port is completely under the skin, you can usually bathe and even swim without being concerned about the risk of infection. The risk of the surgical procedure to install the port: Any surgical procedure can carry the risk of infection. Uncommon complications (those which occur in less than one percent of people) of insertion can include bleeding (such as if the subclavian vein is punctured) and a pneumothorax (collapse of the lung) if your lung is accidentally punctured during the procedure. Infection: The risk of infection varies in studies but isn’t uncommon. If a port becomes infected, it will often need to be removed and replaced. Research is evaluating methods of reducing this risk, so it is important to talk to your oncologist about how to properly manage your port. Mechanical problems that cause the port to stop working: In some cases, mechanical problems, such as movement of the catheter or separation of the port from the skin, can cause a port to stop working. Limitations in activity: Though activities such as bathing and swimming are usually okay, your oncologist may recommend holding off on exercises to strengthen your upper body or arms until your port is removed. Scarring: Given the gravity of cancer treatment, a scar from the port is a relatively minor drawback. But some people may find a scar on their upper chest disturbing for cosmetic reasons or because it is a symbol that you once went through chemotherapy. Several studies in recent years have looked at methods of reducing the risk of bacterial colonization on a port and the subsequent risk of infection (sepsis). Sepsis is a "body-wide" infection in which bacteria are present in the blood and can be very serious. While routinely using antibiotics has not been found helpful, flushing the catheter with an antibiotic/heparin solution appears to reduce the risk. Cleansing of the skin has not proven to be very beneficial at this time, but using dressings impregnated with antibiotics may help. It's also thought that securing the port with a method other than sutures (stitches) may reduce infection risk. As noted, this is an area of active research and you can ask your oncologist what is currently recommended. Clotting or thrombosis in a port is common and is a frequent reason for which a port needs to be removed and often replaced. Routinely flushing a port with heparin and saline does not seem to make much difference, nor has a reduction been noted with using low dose heparin (though it did increase bleeding). Those who are at greater risk are those who have a history of deep vein thrombosis in the past. The location of the end of the catheter may also make a difference. Overall, however, the risk of thrombosis in a port is significantly less than that in a PICC line. PICC stands for "peripherally inserted central catheter." A PICC line is usually placed in a vein for shorter-term treatment (for example, for access that will be needed for one to six weeks only). PICC lines are placed in your arm closer to your skin (subcutaneous) and do not reach as close to your heart as a port catheter. When you and your physician are confident that your port is no longer needed, it may be removed through a simple surgical procedure. What Will You Need to Know If You Have a Port? It will be important to ask your doctor if your port needs any special care, such as flushing with a medication to help prevent clots from forming. Since infection is the most common complication of having a port, contact your doctor if you develop a fever or note any redness, swelling, pain or drainage around your port. Heibl, C. et al. Complications associated with the use of Port-a-Caths in patients with malignant or hematological disease: a single-centre prospective analysis. European Journal of Cancer Care. 2010. 19(5):676-81. Madabhavi, I., Patel, A., Sarkar, M. et al. A Study of Use of “PORT” Catheter in Patients With Cancer: A Single-Center Experience. Clinical Medicine Insights: Oncology. 2017. 11: 1179554917691031. Narducci, F. et al. Totally implantable venous access port systems and risk factors for complications: a one-year prospective study in a cancer centre. European Journal of Surgical Oncology. 2011. 37(10):913-8.